PowerPoint presentations can be spiced up further by adding visual movies. Do you want to add a MP4 video file for your presentation to make it interesting and appealing? Whereas, in most cases, embedding MP4 in PowerPoint will end in failure. Microsoft PowerPoint, no matter PowerPoint version is 2013, 2010, 2007, 2003 or 2000, supports many kinds of video file formats, such as WMV, ASF, AVI, and MPG. However, it does not support MP4 file. This is why when we tried to insert MP4 file into PowerPoint slide, only get error message "PowerPoint couldn't insert a movie from the selected file. Either the file is non-standard, or QuickTime is not properly installed." or evern successfully embed a MP4 movie in PowerPoint, but get a "Cannot play back the file. The format is not supported" message when you play the video during a presentation. Well, if you are looking for ways to embed and play MP4 in PowerPoint 2010, 2007, 2003, 2000 to PowerPoint, just read on. This article will show you 2 parts to finish your task. One is to convert MP4 to PowerPoint supported video, the other is to insert the converted video to PowerPoint. Follow this guide to find out how, regardless of your version of PowerPoint. To insert MP4 videos to PPT without any hassle, we need to transform MP4 resource to PowerPoint WMV (with WMV8 codec), AVI (with some ancient codec) or MPG format, which are universal formats among all versions of PowerPoint firstly. To accomplish the task, you need to seek help from a MP4 Video converter that supports the MP4 video input and WMV, AVI, MPG output. 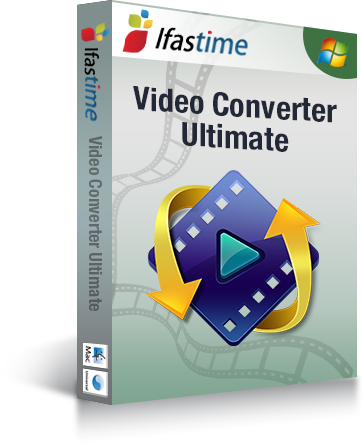 Here iFastime Video Converter Ultimate is highly recommended to help you achieve your task. This program can help you easily and quickly encode MP4 videos to PowerPoint friendly WMV, AVI, ASF, and MPG (MPEG-1) to let you insert MP4 into PowerPoint with ease. Besides, the built-in video editor lets you personalize your video. In addition to MP4, it can also transform MOV, WTV, WebM, M4V, MXF, YouTube FLV, Blu-ray, DVD movies, etc to PowerPoint sensible formats. Besides converting MP4 to PowerPoint supported video format, the above powerful MP4 converter can also convert MP4 for playback on iPad, iPhone, Apple TV, Zune, Xbox 360, PSP, PS3, mobile phone and more, or import MP4 to Sony Vegas, Pinnacle Studio for editing. Enjoying MP4 and Saving MP4 files is just so simple. If you insert MP4 in PPT on Mac (El Capitan), turn to iFastime Video Converter Ultimate for Mac. Now, please download the most suitable program according to your need and follow the corresponding tutorial. First, launch the MP4 to PPT converter. Click "Add video" button on the main interface to import MP4 files to the app. 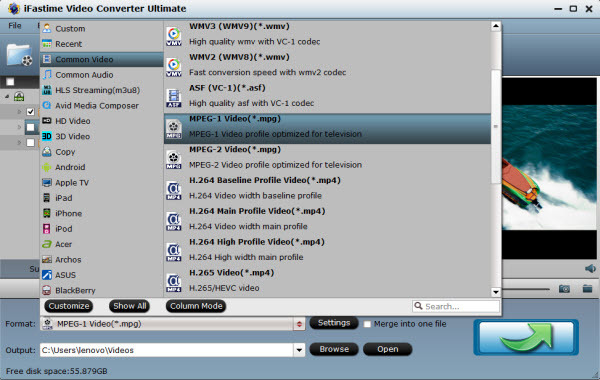 The MP4 Video converter supports batch conversion, so you can add a pile of videos to enjoy the fast conversion speed. Now you should go to the Output Format drop-down list, choose "MPEG-1 Video(*.mpg)" as the output format on the Format > Common Video list. Tips: Though ASF, AVI, and WMV are also compatible with PowerPoint, MPEG is more preferable. For this video file can be played on both PC and Mac, while others can only be played on PC. If you use a Windows, you also can select WMV2 (WMV8)(*.wmv), DivX AVI - Audio Video Interleaved(DivX)(*.avi), or Xvid AVI - Audio Video Interleaved(Xvid)(*.avi) from the drop down menu. 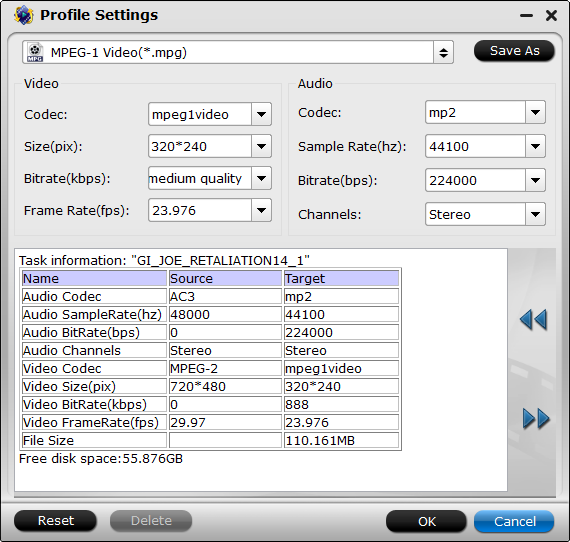 If you use a Mac, you can also select MOV as output video format. 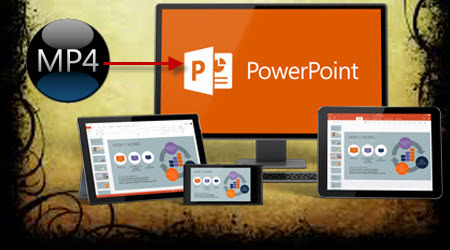 What's more, if you want to add FLAC, OGG, AC3, audio files to PowerPoint, this MP4 to PowerPoint Converter is also your best choice, with which, just change these them to PowerPoint recognizable audio formats like MP3, AIFF, WAV, WMA, etc, and then you can play them in PowerPoint. Press "Settings" button, a setting box will pop up, select wanted resolution or write your desired ones like "1920*1080" from the drop down list of "Size(Pix)". You may also select lower or higher resolution according to your specific needs. If you want to get rid of some part of the video, you can click the Edit button. When enter the edit > Trim interface, you should either drag the slider bar back and forth or set the start time and the end time for the video to get the part you want. After everything is ready, you should press the big, shiny "Start conversion" button to begin the MP4 video to PPT conversion. After the conversion, you will get the desired videos in the destination folder. 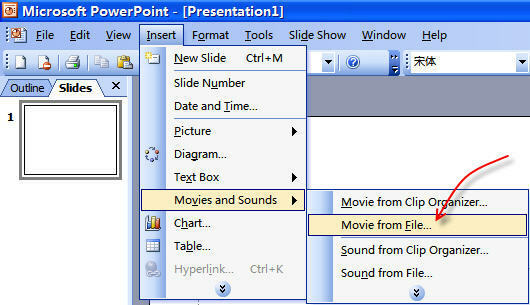 For PowerPoint 2007, choose Movie and select the video clips. For PowerPoint 2003, select "Movie and Sounds" > "Movie from File" to choose the video clips. Done! In this way, you can insert and embed MP4 in PowerPoint 2010, 2007, 2003, 2005, 2002, 2000, or even PowerPoint 95, 97 with no restriction! Enjoy. a. With PowerPoint 2010, when you have the QuickTime player installed on your computer, you can insert an Apple QuickTime movie (.mov, .mp4) file. b. The PowerPoint 2010 64-bit version is not compatible with 32-bit versions of QuickTime or Flash. You must install a 64-bit version of QuickTime or Flash, or a 32-bit version of PowerPoint 2010. You can change the extension for adding MP4 to PPT, but is not a general approach since this method doesn't always work. I enjoy reading all of your article.